I apologise for the poor picture quality in this post - all photos were taken on my phone. But just buying the Realm of Battle Board is not enough, and the £175 tile set needs painting to make your battles truly epic, and for a while this is where I was stumped. I have no garden, no garage and no large ventilated areas... or any ventilated areas for that matter. This was a matter of pure frustration as I desperately wanted to start and finish the board fairly quickly, plus I needed to come up with a scheme for my board. For the scheme, this was a fairly quick decision, I decided to go with a snow themed board because a) I don't see enough of them and b) it suits my Necron army's bases. As for the time and space to do it, fortunately last Saturday I was able to hitch a lift with my flat mate to the London Hackspace, a community run hacker space where I had enough room and tools (excluding paints of course) that I could get the job done. After much thought on my painting method, I decided go with the method used on Games Workshop's website, mostly because it seemed a simple and effective way to do a snow board. I began by spraying all the tiles with Chaos Black, then using the Citadel Spray Gun (with free propellant thanks to a working air compressor someone was just throwing away!) 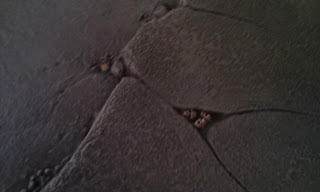 to spray The Fang over all areas of the board except the rocky areas. I purposely made the grey splotchy and non-uniform to imitate the pattern of fallen snow. 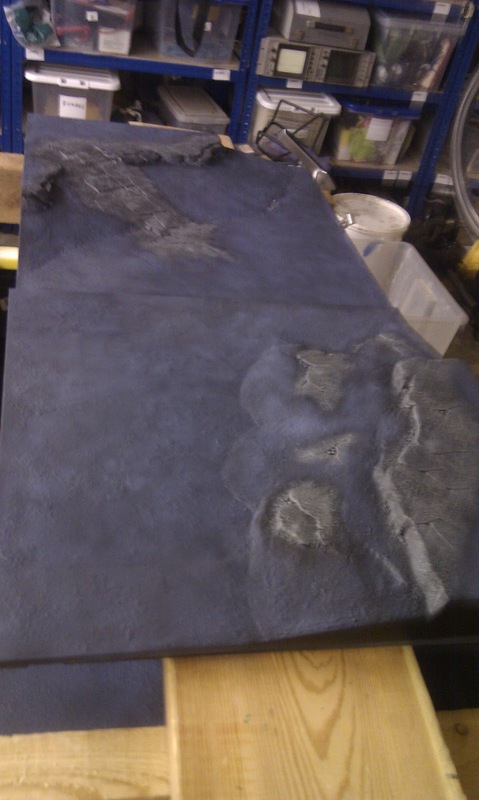 I then gave a heavy drybrush of Codex Grey over all the rocky areas. I spray a bit more of The Fang around the rocky areas to blend the sections together. 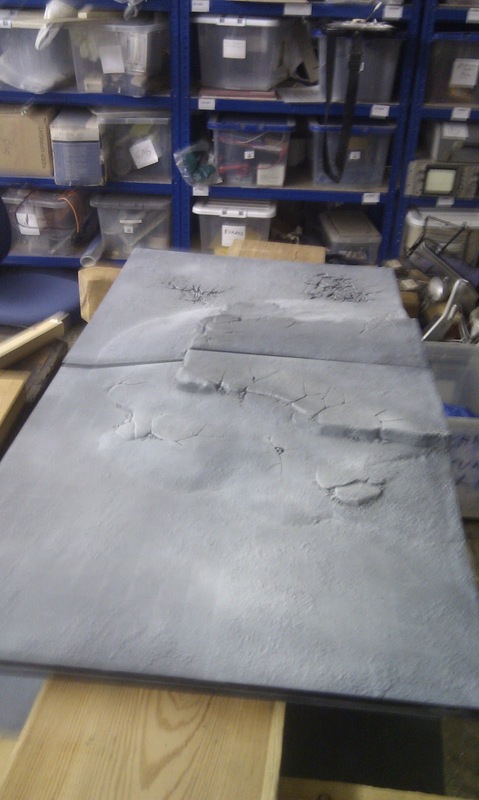 I was quite surprised at how clear the grey came out on the rocky areas, and even though it does fit in fantastically with the rest of the board, this was the undercoat colour to give more definition to the board once it's finished. With the lion's share of the work done, I was able to complete the rest of my battle board at home. 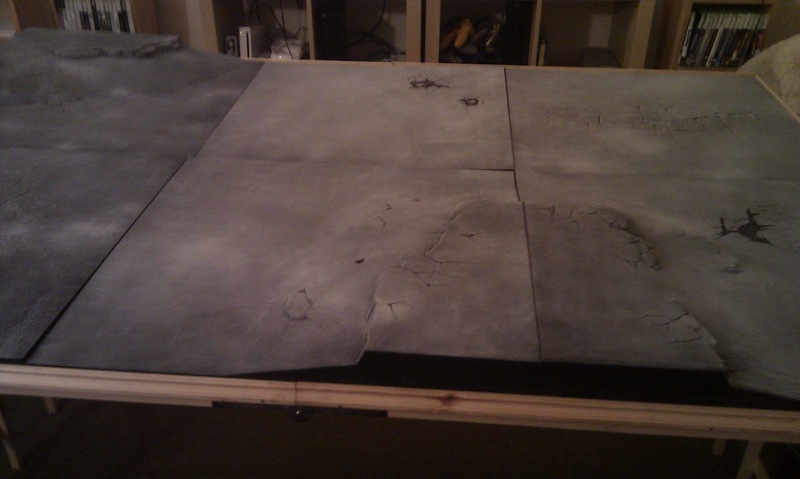 I started by laying the full thing out on my customised wall pasting table I made a while ago - though I will say if you use a wallpaper pasting table to play on, avoid putting a boarder around it unlike me as the table won't fit the whole thing perfectly. 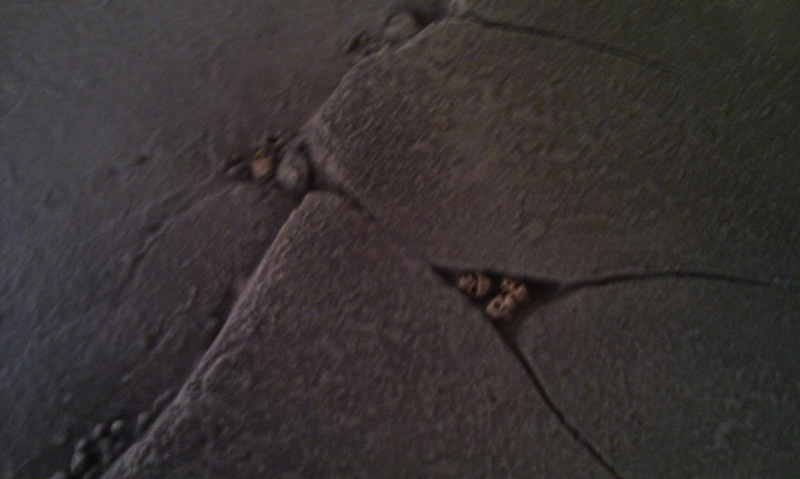 This was where I would fine tune the board and finish the infamous (and not particularly great) pit o'skulls. My original plan was to paint the skulls then layer blues over them before using realistic water to make a pool and dust over it with Woodland Scenic Snowflakes to imitate a frozen pool. It turns out you don't need realistic water to make these things look like pools. I started off with painting just the skulls, which was simply a matter of painting them white and coating them with Agrax Earthshade - nothing fancy, and I did this with every bone and skull on the board. I originally planned to drybrush them with Bleached Bone as well, but I was happy with them as they were and felt it was unnecessary. I then drowned (and I meant DROWNED) the skulls in all the places I wanted my ice with Drakenhof Nightshade to give the base colour for my ice. Something I have learnt about the new Games Workshop shades is that, when used in extremely heavy quantities like this, they dry gloss, not matt like the old washes. However, this happy accident actually worked to my advantage as it gave the pools more of a wet look, really making them look like icy cold, shimmering pools. I loved it so much I didn't want to tamper with it, so I left it and haven't regretted it. I also troubled myself to add definition. Finally, my flat mate pointed out that the cliffs would look better if the cracks in the hills were more defined. After spending the time to do this I am inclined to agree. 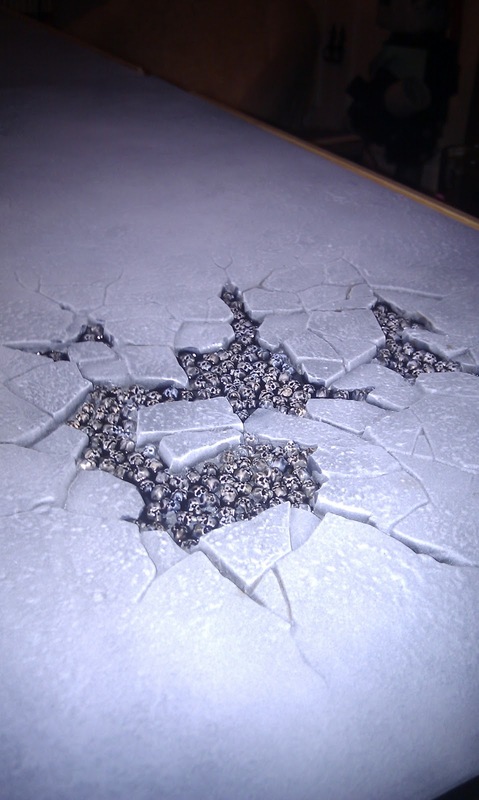 This was simply a case of painting some Agrax Earthshade into the deeper cracks on the board. I decided to add this last section after I learnt how much paint this bad boy takes up, mostly for your sakes more than anything. Any paint you spray to create this thing eats paint for breakfast, lunch and dinner. Throughout the whole first day process, I went through 1 and 3 quarters worth of Chaos Black primer, and entire can of Skull White primer and 3 pots of The Fang, and even then I reckon I should have chewed through more of The Fang than that. 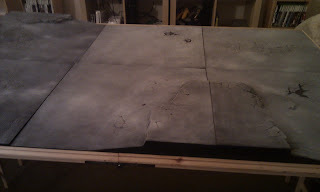 If you take on the project of a Realm of Battle Board, be prepared! Stock up on spray paints!